Explore the extremes of photography and HD video with the ultra-wide-angle coverage of this practical DX-format zoom lens. With the widest end of 10mm covering a 109° angle of view (nearly fisheye), the AF-S DX NIKKOR 10–24mm f/3.5-4.5G ED delivers dramatic perspectives for a creative edge. Close-up shooting capability, minimal distortion and compact design make it a versatile photo and HD video partner, no matter where you choose to take it. 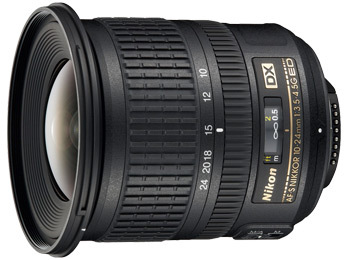 The AF-S DX NIKKOR 10–24mm f/3.5-4.5G ED was built to capture the expansiveness and drama of the world around you. It’s ideal for shooting photos and HD video of landscapes, cityscapes, interiors, architecture and more. It’s also versatile enough to focus on subjects as close as 0.8-ft. And thanks to a host of Nikon technologies, you can be certain that your world will always be captured with remarkable clarity. 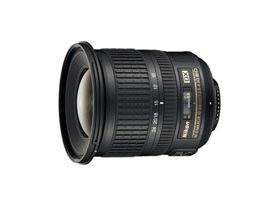 The AF-S DX NIKKOR 10–24mm f/3.5-4.5G ED is an advanced lens optimized for DX-format Nikon D-SLR cameras. From its ultra-fast, ultra-quiet Silent Wave Motor (SWM) autofocus motor to its ghosting and flare reducing Nikon Super Integrated Coating (SIC), the AF-S DX NIKKOR 10–24mm f/3.5-4.5G ED helps your D-SLR achieve peak performance in both still and HD video shooting.